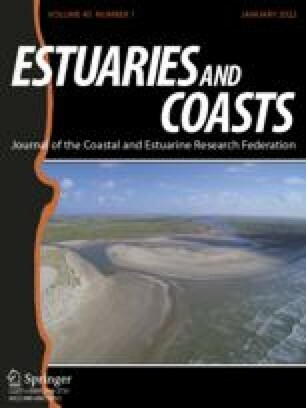 The metabolism and carbon flux in the western sector of the highly dynamic coastal lagoon Ria Formosa (south Portugal) were assessed to elucidate the relative importance of the contribution of the main communities, the treated sewage inputs from the adjacent city of Faro, and the exchange with the adjacent coastal waters to the ecosystem metabolism. The results depict the Ria Formosa as being a highly productive ecosystem dominated by the seagrassZostera noltii. The community dominated by the seagrassCymodocea nodosa had half of the gross production ofZ. noltii, followed by bare sediments and phytoplankton. The net contribution of seagrasses to community metabolism was negligible, as bothZ. noltii andC. nodosa showed a production: respiration ratio close to 1. Benthic microalgae emerge as the most important components of the net metabolism. The western sector of Ria Formosa was in metabolic balance during the summer when the study was done. Even though the total net ecosystem production was 7.22 Kmol C d−1, the error associated with this estimate was 8.38 Kmol C d−1, so ecosystem net production was not significantly different from zero. The Ria Formosa ecosystem is shallow and rapidly flushed by the tides, which force an important exchange of dissolved organic carbon (DOC) and particulate organic carbon (POC) with the adjacent coastal waters. The daily net export rate to the adjacent coastal waters, 0.98 Kmol d−1, represented 7.6% of the net ecosystem production, suggesting that the bulk of the net ecosystem production accumulates within the ecosystem. The organic carbon retention in the western sector of the Ria Formosa is higher than net production, because the allochthonous carbon inputs from urban sewage enter the carbon mass balance with about 40% of the autochthonous processes, at about 1.6 Kmol d−1 of DOC and 2.8 Kmol d−1 of POC. The western sector of Ria Formosa has an organic carbon sink of about 46.4 tons per year. Most of this is harvested in the form of molluscs (clams, cuttlefish, etc.) and fish (sea bream, sea bass, etc.). The total carbon harvested every year in the form of bivalves is about 40 tons, rendering the Ria Formosa the most productive seafood area in Portugal.